Standing ovation. 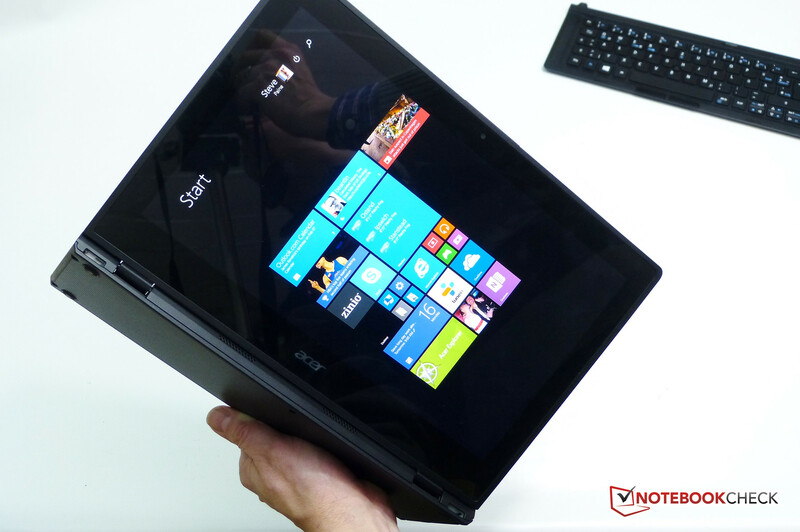 The Acer Aspire Switch 12 design has surprised us in its flexibility and ability to be a very productive hybrid PC with a huge range of usage scenarios and processing capability. 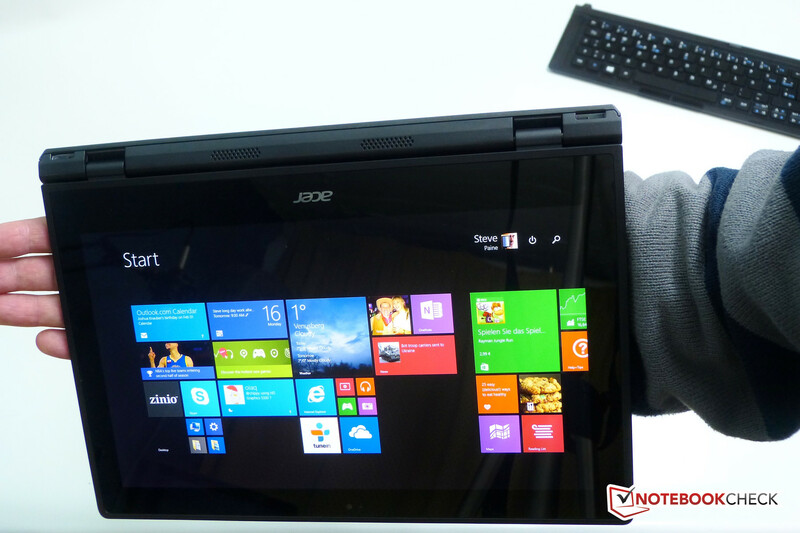 The Acer Aspire Switch series comprises the Switch 10, Switch 11 and now the Switch 12. 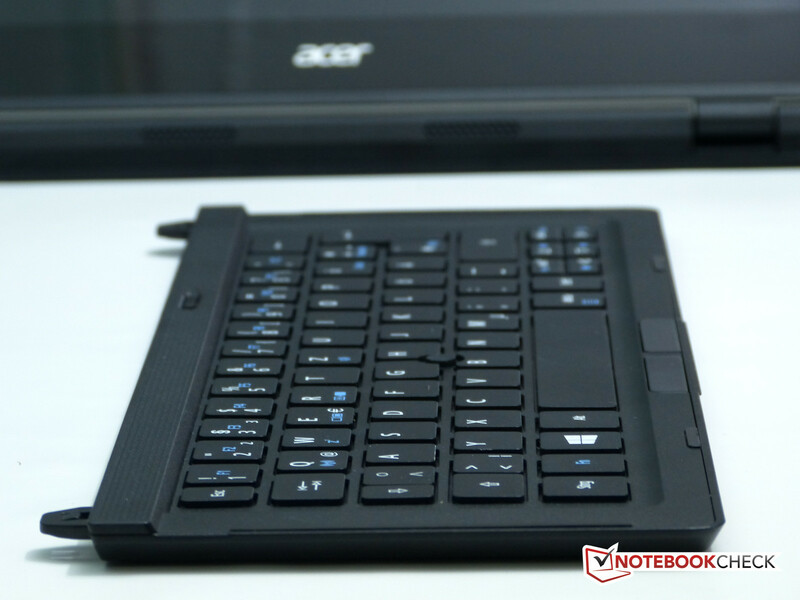 While they all include detachable tablets Acer has take a different design approach with the Intel Core-M based Switch 12. The screen and hinge puts it in the same stand-able tablet class as the Surface Pro 3 but it's the detachable keyboard that really sets it apart. 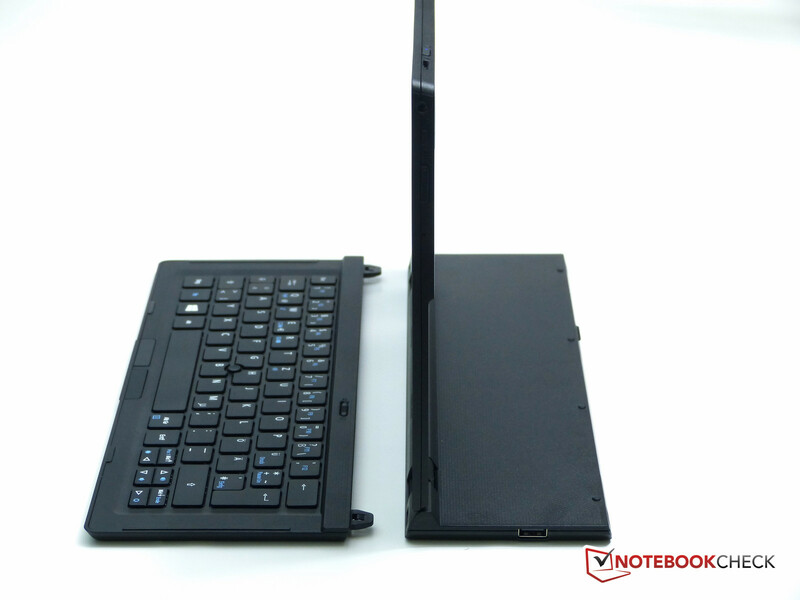 It's a full size keyboard with chicklet keys that stows with the stand and can either be attached to the front of the tablet or detached and used away from the unit thanks to a built-in battery and wireless link. 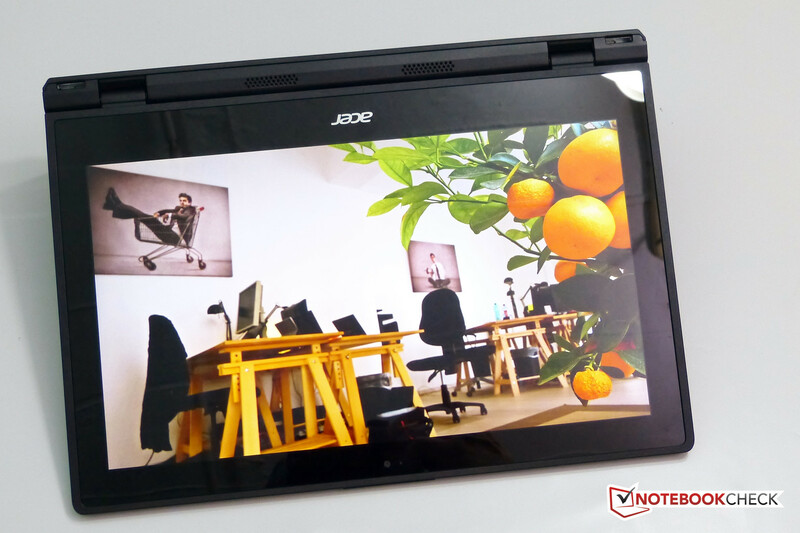 By using the Core M platform Acer have been able to provide processing power above that which an Atom-based 2-in-1 can offer and yet remain completely fanless. Where some 2-in-1s can be labeled 'tablet-first' the Switch 12 is a much more laptop-first design and it could appeal to a broad range of users. We'll look at some interesting usage scenarios in the review and cover productivity, gaming and battery life with comparisons to other convertibles. 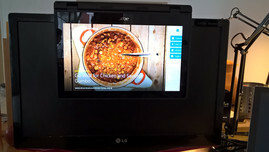 1920x1080 (16:9) IPS screen with digitizer layer. There's no TPM, NFC, compass or digitizer pen included. Microsoft Office 365 is not included on this tablet PC. 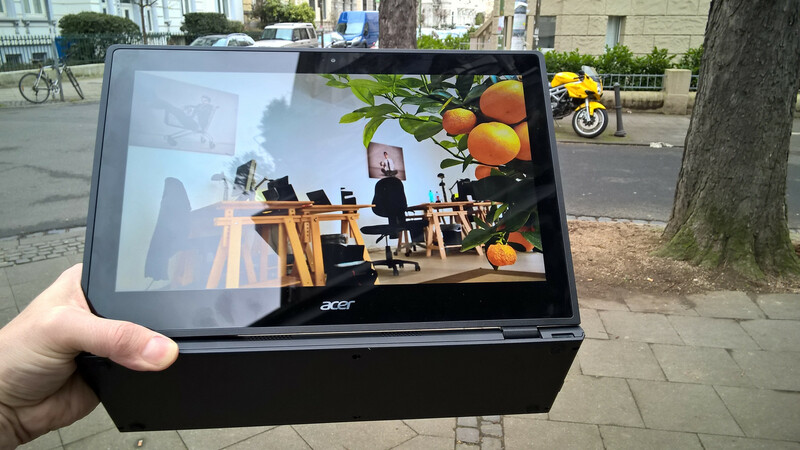 As we unboxed the Acer Aspire Switch 12 we couldn't help notice the weight of the tablet. At 1.1 KG (2.4 pounds) it's too heavy to be instantly attractive and that's largely due to the stand that is permanently attached to the unit. 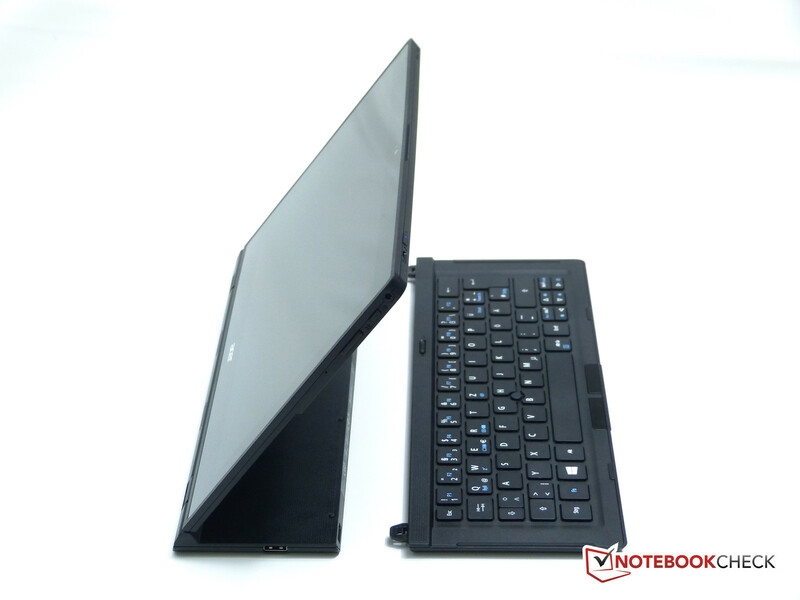 It's like Acer looked at a Lenovo Flex design and decided to cut the keyboard off leaving a stub. It turns out that the stand is extremely stable but we'll talk more about that later. What's more important is what happened when we tried to fold the keyboard section back over the screen as you would normally do with a laptop. It doesn't! 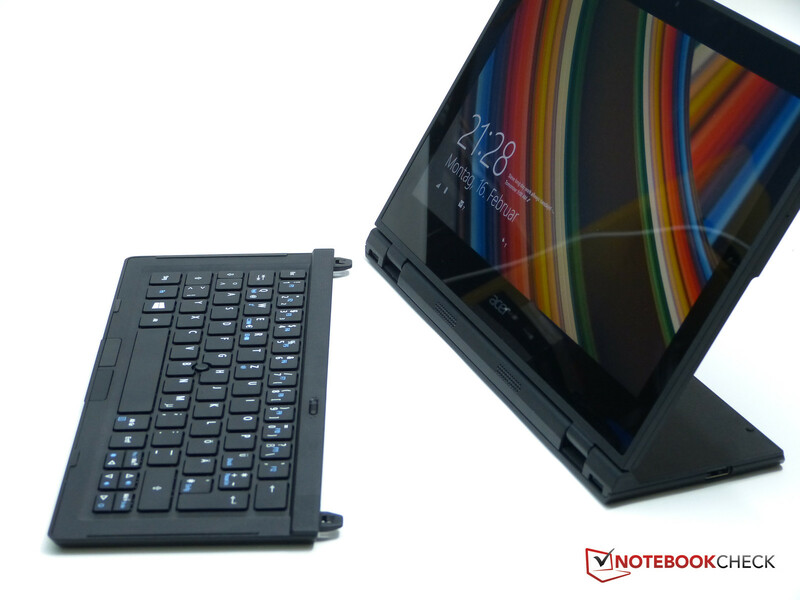 Although you can attache the keyboard at the rear you can't fold it forward. You're left with a permanently exposed screen. 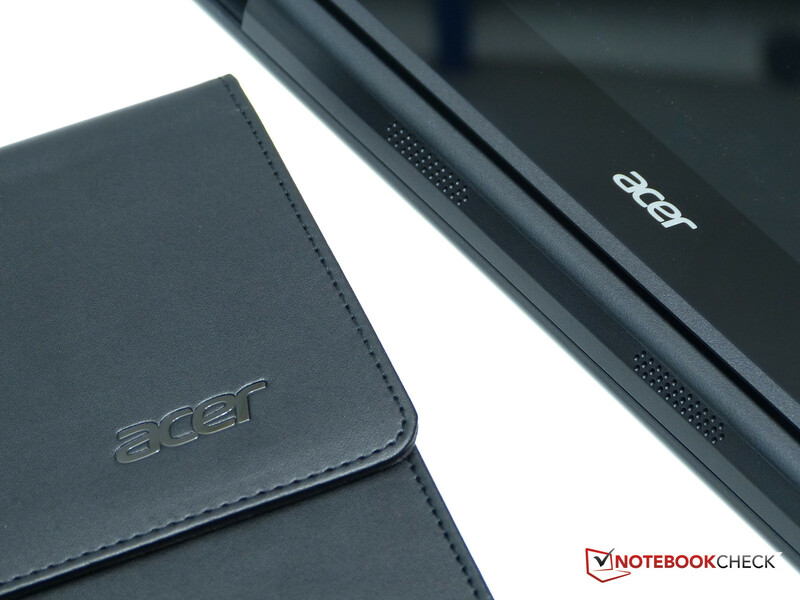 Acer have included a good quality case for protection but that adds to the weight. In total, 2.1 KG / 4.6 pounds with the power adapter. The first few minutes were a little confusing but after understanding the layout of the unit (which we're sure that most customers will actually be familiar with before they buy the Switch 12) we 'got it'! The packaging is good quality despite our unit being marked 'demo' so we expect this to be near final packaging. The casing is made from a hard textured plastic and feels a little cheap. Compared to the Surface Pro 3 there's no competition and that applies to the weight too. The Acer Aspire Switch 12 feels solid but dense and although the stand provides ways to hold the unit it still doesn't feel like something that can be held for, say, 30 minutes of reading Flipboard. The edges seem a little too sharp as you hold the unit and because of the width there's a huge leverage felt on the wrist in landscape mode. 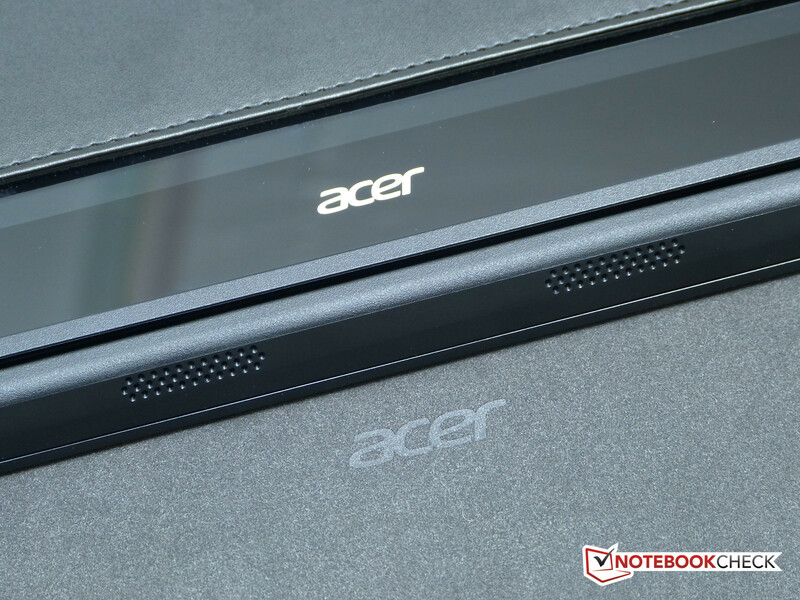 There's no creaking or bad joints though so perhaps it will turn out to be a rugged choice of materials from Acer. Perhaps! The case is sealed with no obvious way to get inside although when we ran a fingernail along the join it popped-apart slightly. There are screws on the folding base and it looks like the battery might be housed inside this. As the processor is housed in the top-left (as you face the tablet) and the bottom half of the tablet is extremely thin it makes sense that the battery is in the base. The hinge, an extremely important part of the design, feels strong and you can push the tablet all the way back from 90-degrees back to about 30 degrees before the unit falls on its back and reveals the tent mode that's going to be be perfect for coffee-shop news reading or for some pen-based activities. The pen, unfortunately, is an optional accessory. With the keyboard attached to the front you can drop the screen all the way back and it won't fall over which makes it extremely stable on the lap and due to the extreme screen angles, center-mounted hinge and mouse pointer, better than most laptops. 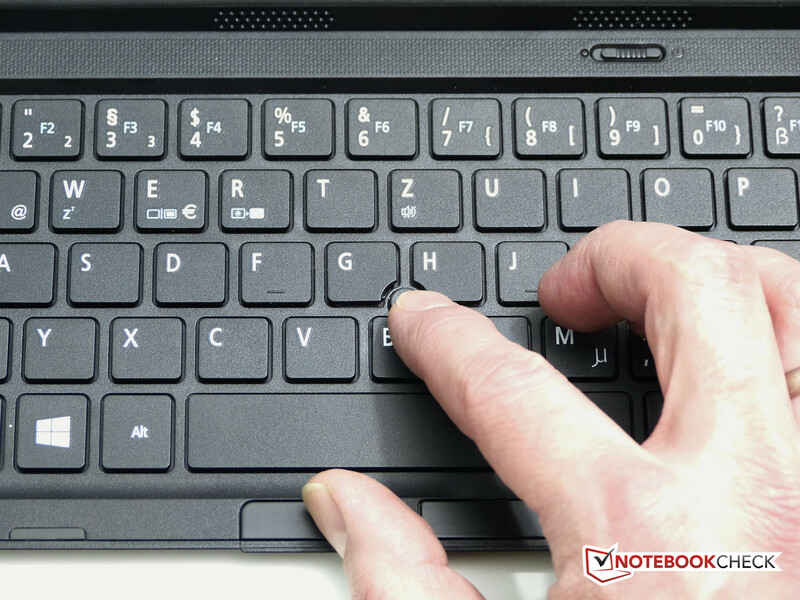 Finally there's a 'desktop' mode which is what you get when you separate the keyboard from the unit. It feels like a mini all-in-one and again is better in some respect to a laptop that requires the screen to stay at a fixed distance to the eyes. There are arguably some ergonomic advantages to the Switch 12 design. 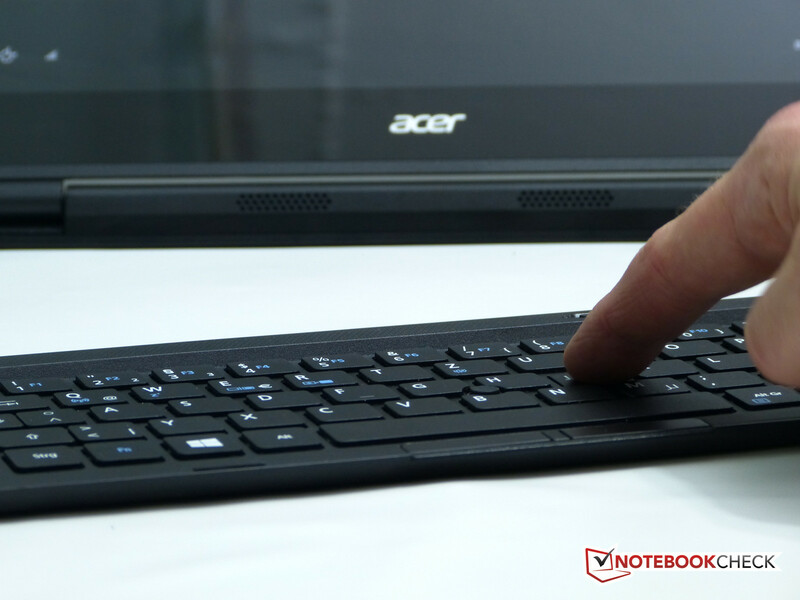 Finally there's a mode that Acer haven't mentioned as the keyboard and mouse pointer can be used many meters away. For PowerPoint presentations this is a real bonus. 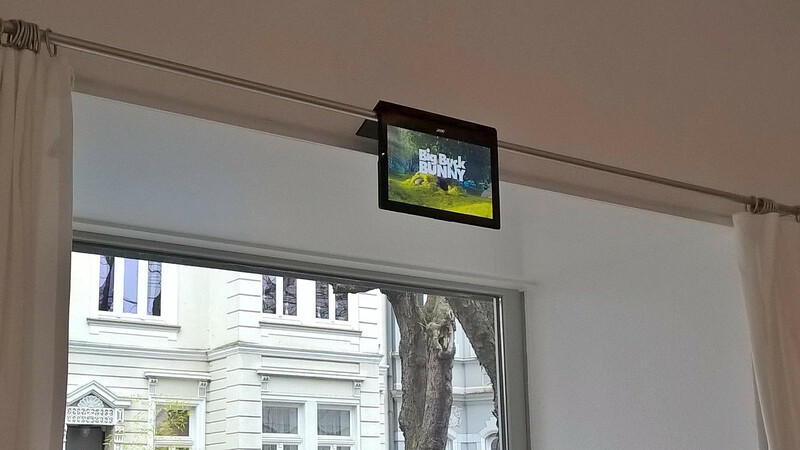 We were able to control the Switch 12 tablet from over 10 meters away and as there's Miracast and WiDi (we assume due to the Intel wireless module) support built-in you could potentially be 20 meters or more away from an extremely large screen at full HD or, potentially, a 4K screen over WiDi. There are two front-facing speakers integrated into the hinge and a keyboard power-off button, on the keyboard. The case materials might be a little basic but the design (we'll talk more about the keyboard below) is inspiring. Thinking forward to future generations of this design where the tablet could weigh a lot less or where the battery could be integrated inside (allowing for the stand to be removed) is even more exciting. Take a look at the images below for a selection of usage modes. 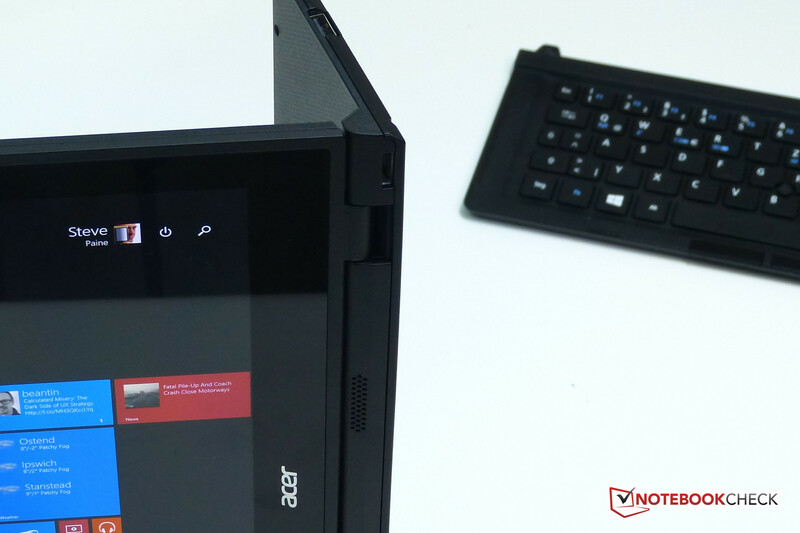 Acer Aspire Switch 12 tent mode. 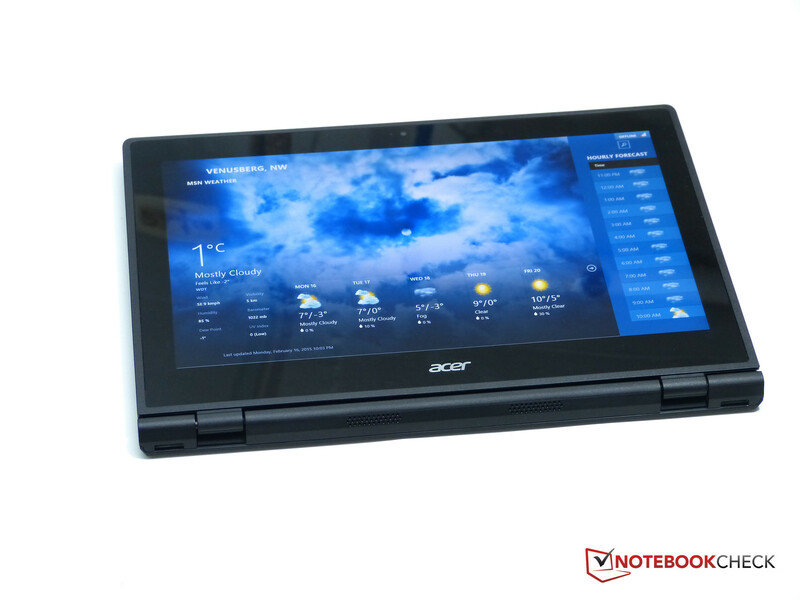 Acer Aspire Switch 12 desktop mode. 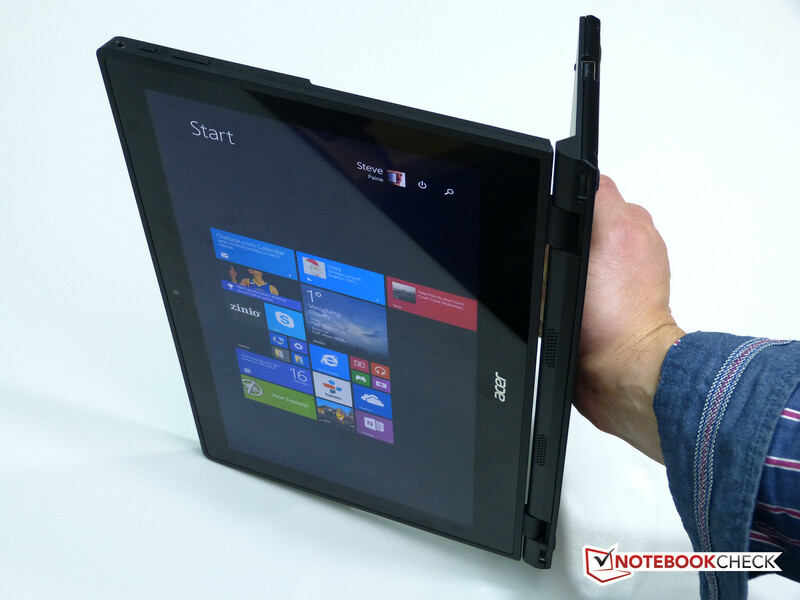 Acer Aspire Switch 12 folded-back tablet. 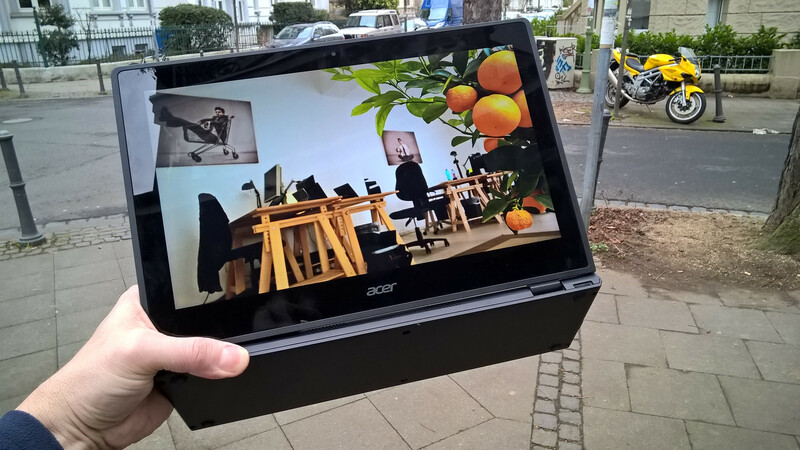 Acer Aspire Switch 12 holding in landscape tablet mode. 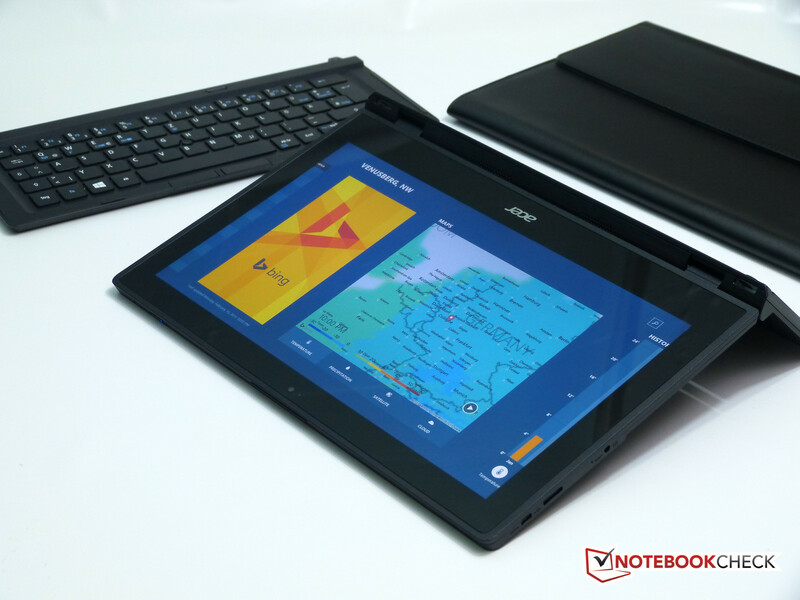 Acer Aspire Switch 12 classic landscape tablet. 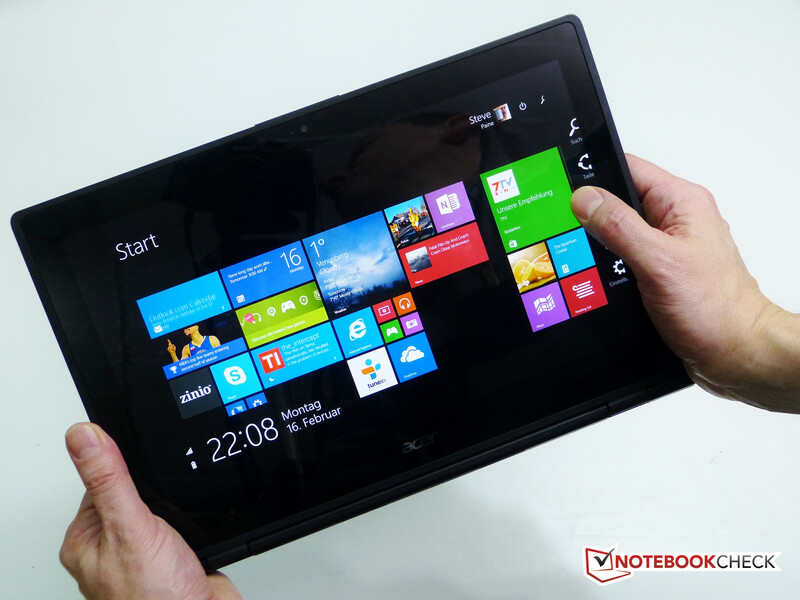 Acer Aspire Switch 12 portrait tablet. 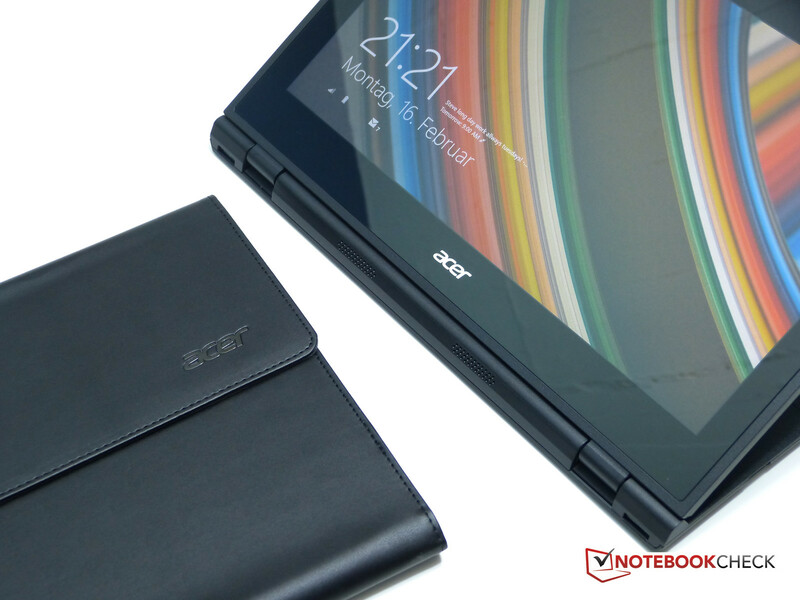 The Acer Aspire Switch 12 has a lot of interesting usage scenarios and as we went through this review we found more and more ways to hold and use the tablet. A discussion was had about cooking (the bright screen, good speaker and small footprint make it good for a kitchen) and we even tried hanging the Switch 12 using the stand. It works, and it's interesting to think about ways this can be used in decoration, advertising and in studios. Take a look at the images below for some usage ideas. Detachable keyboard helps with ergonomics. 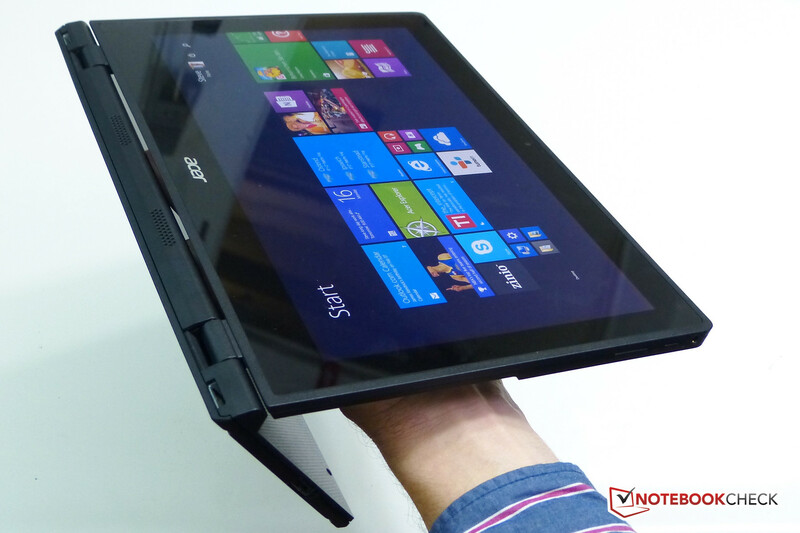 Acer Aspire Switch 12 hanging. 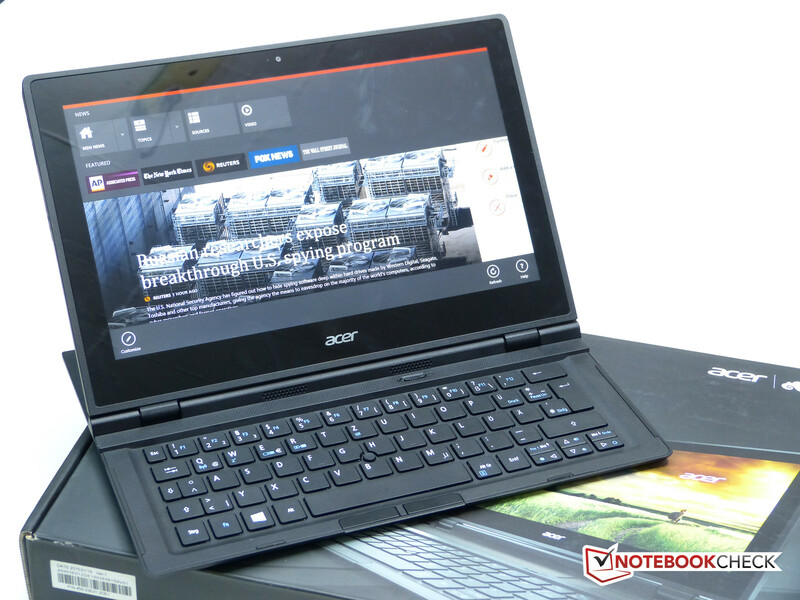 Acer Switch 12. Also usable as a laptop! As tablets get smaller there's less and less room for traditional ports so what you find on the Acer Aspire Switch 12 is, in comparison to tablets, very good. In comparison to laptops however it's missing a few options. Starting with the Micro USB 3.0 port at least you've got one super-speed USB port. 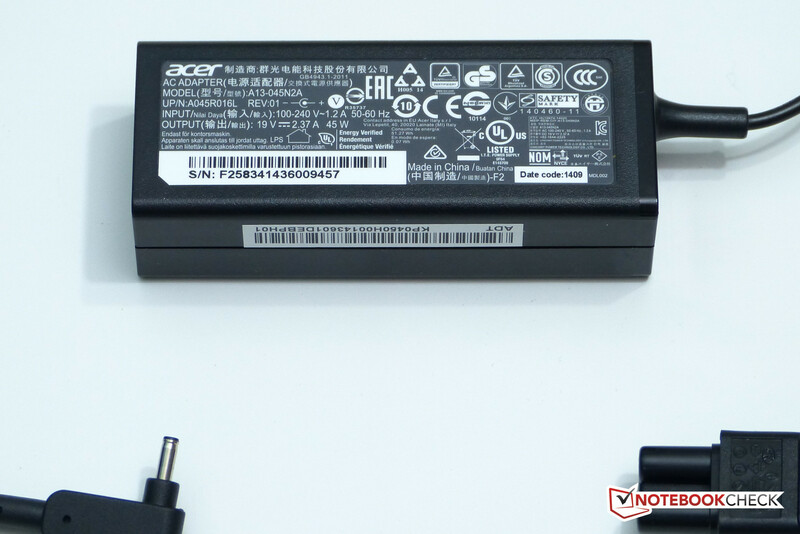 You'll need to buy the appropriate adapter (unless Acer decide to ship that in retail boxes - they have with tablets in the past) but you can use a micro USB 2.0 to USB female (OTG adaptor) to get USB 2.0 speeds from the port. Alternatively there's a full-size USB 2.0 port on the hinged stand. The stand also has a 3-pin connector used to give charging power to the keyboard. Unfortunately those pins are not present on the front of the keyboard so there's no way of using the keyboard and charging it at the same time. Back to the tablet and you'll find a micro HDMI port and DC power input on the left with the micro-USB port. On the right you'll find a headset port. There's also a built-in mono mic here along with the Windows button and a volume rocker. The power button is on the top-right next to a micro-SD card slot. We think it's a real shame that there isn't a full SD card slot on the base. Given the presentation flexibility of the screen (and the quality - see below) this would make a great photo previewing tool. The processing power is also enough for basic 1080p video editing too. 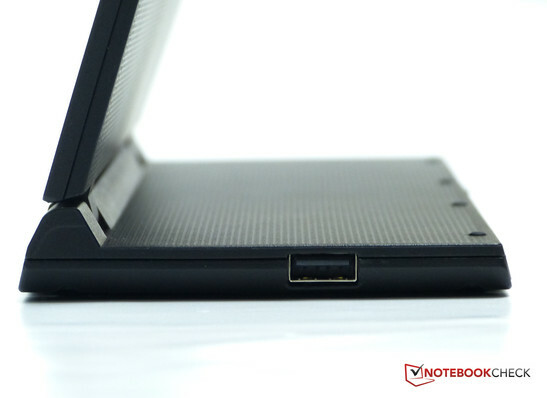 Unfortunately you'll just have to carry the full SD card slot adapter - preferably a USB 3.0 one. With multi-band, multi-protocol WiFi, Bluetooth and keyboard RF there's a lot on offer here and the highlight, by current-day standards, is the AC WiFi. The Intel AC-7265 module supports up to 867 Mbps of (theoretical) throughput along with the common WiFi-abg and n standards. In a local NAS test we saw over 10MB/s being transferred on our AC WiFi network at 4 meters distance. It's a healthy figure but the Surface Pro 3, tested before and after the Switch 12 test, transferred at 2.5 times that speed - nearly half of the speed we got over a directly-connect Gigabit Ethernet port via a USB 3.0 adaptor. We were able to reach that 25 MB/s speed on the Acer Switch 12 but at 2 meters from the WiFi router. Conditions will vary from hotspot to hotspot but it looks, from our basic test, that the Surface Pro 3 outperforms the Acer Aspire Switch 12. The WiFi module also supports Intel WiDi but we weren't able to test that. Update: In a second test, placing the Acer Aspire Switch 12 in exactly the same position as the Microsoft Surface Pro 3 we saw a maximum 15 MB/s and a very short burst of 20 MB/s but not the sustained speeds seen on the Surface Pro 3. Note that the SSD storage on both of these devices should be fast enough that it's not a bottleneck in this test. Bluetooth 4.0 (including low-energy mode) is available and a Microsoft Lumia 830 was able to transfer photos with no problem. A smart, tight-fitting case (that looks like leather but we don't think it is real leather) is provided with the Switch 12. The power supply must be carried separately. As previously mentioned there's no digitizer pen provided. 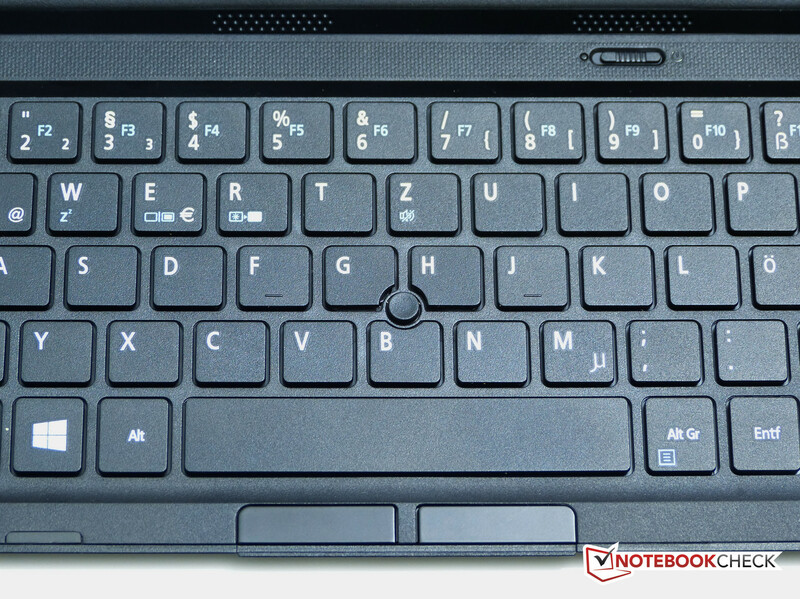 The detachable wireless (only) keyboard has full-size keys with the function row integrated into the numeric row so that only 5 rows of keys exists. There's no number-pad function and features like sleep, airplane mode, screen backlight off (useful for low-power music streaming or to save power when video rendering) screen brightness and volume are integrated as additional FN-keys. It means that there's a lot of text on the keycaps which might be a little confusing for some. The keys themselves have a little more travel than the type-cover keyboard on the Surface Pro 3 but are unfortunately not back-lit. There's mo flex in the keyboard and it's nice and quiet. Between the G,H and B keys you'll find a simple mouse pointer. It functions well but isn't as advanced as Lenovo or Dell implementations of the feature as there's no tap-to-click support. That might not be a problem for most though as we found the left and right mouse button keys really easy to use. 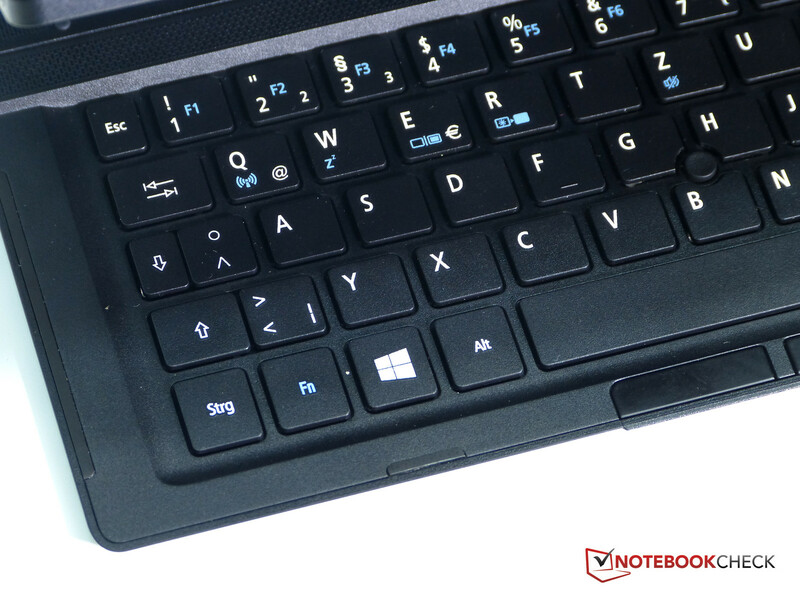 Overall we were quite impressed with the keyboard and it adds to the excellent 'lapping' capabilities that the Switch 12 provides. The keyboard unit has an integrated battery and the charging connector is labeled with a USB power rating. Looking closely at the power connectors reveals what could be a slot for a dedicated charger. Given that we don't know how long the keyboard battery will last and that there's no way of charging the keyboard without docking it to the rear of the unit - where it can't be used - a dedicated USB charging cable would help. We have no further details on that however. 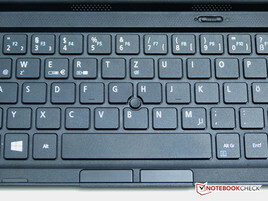 The keyboard's RF signal can bu turned off for airplane-mode or battery-saving measures. A pulsing orange light shows when the unit is charging on the rear of the stand. The wireless keyboard works at 10 meters from the tablet (possibly more - we didn't test any further) which means it could be interesting for presentations. In addition to the mouse pointer and buttons you've obviously got a touchscreen which works well. We had no problems with smooth response and edge response in Fresh Paint and as the Windows screen element sizes were well set, using a finger wasn't a major problem. This Full HD screen could mean that some Windows Desktop programs have very small text and windows elements. Power Director 12 is one example we saw that demonstrated this limitation on the high-density screen. The screen on the low-cost Switch 10 was quite good and Acer have done another good job with the Switch 12. 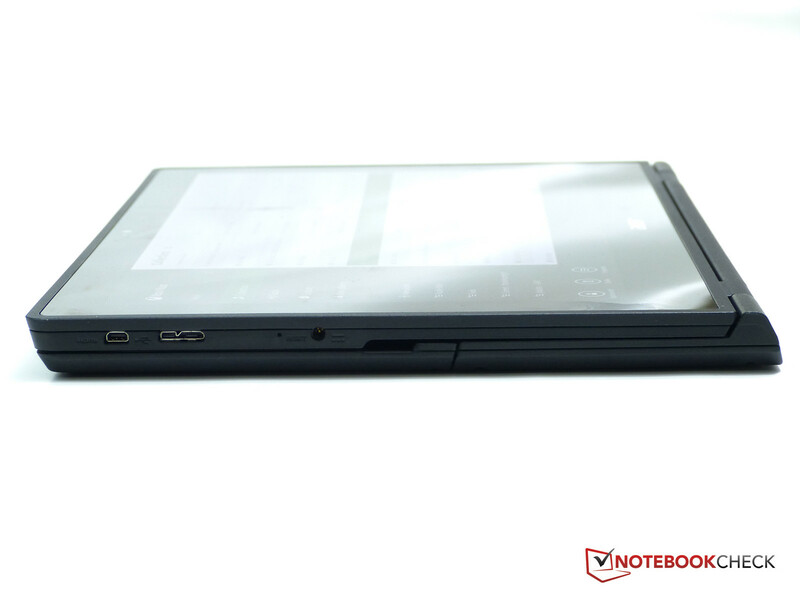 It's a 1920x1080 (16:9 format) IPS LED-backlit screen with glossy finish, 10-point touch and digitizer layer. To the reviewers eyes there was a good range of color, good blacks and good brightness. A playback of the Timescapes 4K trailer (in 2K resolution) was smooth, sharp and enjoyable. Filling the screen with black didn't reveal any edge leakage. At low-brightness with adaptive display brightness enabled there's some obvious hunting which can be removed by turning off adaptive display brightness in the power profile settings. A deeper dive into the testing reveals more detail that we can compare with other devices. See detailed measurements below. 1920x1080 pixels on a 12.5-inch screen is a nice experience and optimal for Windows Desktop where higher-densities can cause issues with some programs and notification boxes. MSN News has sharp text and crisp images. The only downside to the resolution is that native-resolution gaming will have a performance trade-off. When we measured the maximum brightness we saw a good maximum level of 389 nits which beats the Surface Pro 3. Brightness distribution isn't perfect though as we saw only 327 in the lower-left corner and an average distribution of 89%. 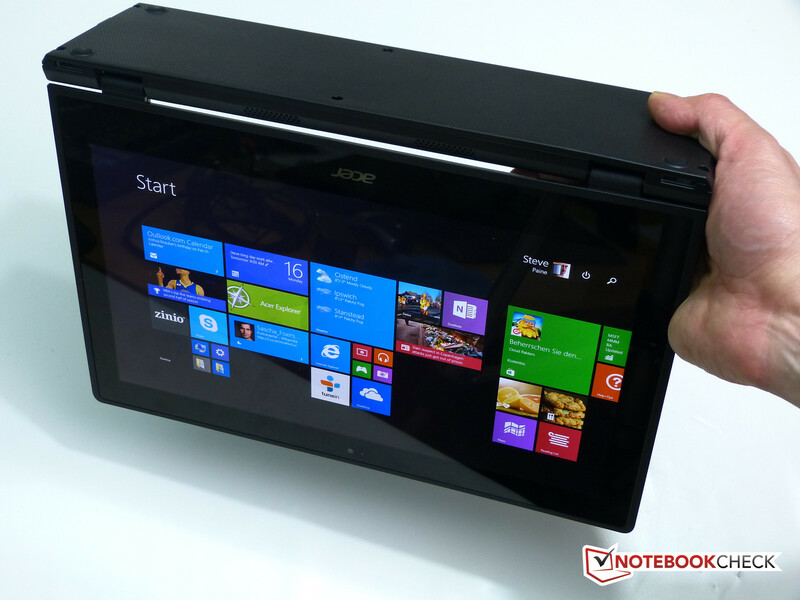 Acer Aspire Switch 12 screen. Good quality overall. Unfortunately we weren't able to measure color gamut (color range coverage) but our Calman tests showed a good CCT average of 6785 and Grayscale and ColorChecker DeltaE values of 3.73 and 4.3 respectively. In an ideal world those figures would be zero but these color accuracy deltas aren't bad at all. Contrast is respectable at 802:1 but the Surface Pro 3 has a higher 1077:1 figure. Overall we feel that the screen is going to provide excellent video playback experience and an acceptable 'field-preview' capability for photographers. What a shame there's no full-size SD card slot though. With a maximum brightness of well over 300cd/m² some outdoor use is possible. Don't expect to use any screen in direct sunlight but this works well in bright areas; Cars, trains and buses included. 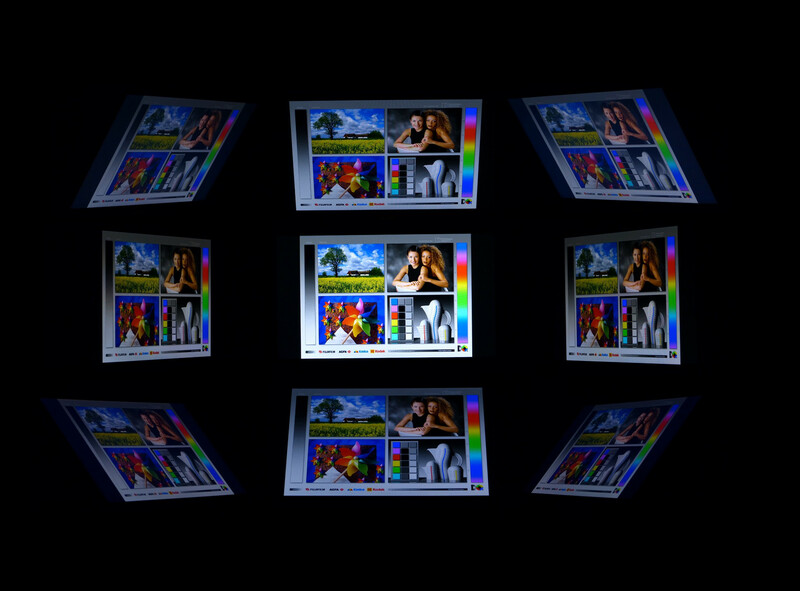 Note that the glossy screen is highly reflective. Viewing angles on the Acer Aspire Switch 12 are good all-round. The composite image shown slightly exagerates what the eye sees in terms of brightness drop-off but you can see there's no color inversion. The Core M CPU has a wide-range of performance characteristics that largely depend on heat dissipation in order to keep the Turbo Boost running. Without it, Core M is no faster than a Baytrail-M CPU. In general you can expect 2013-era (Ivy Bridge) Core i5 Ultrabook performance from the CPU and slightly better than that, under ideal conditions, for the GPU performance. 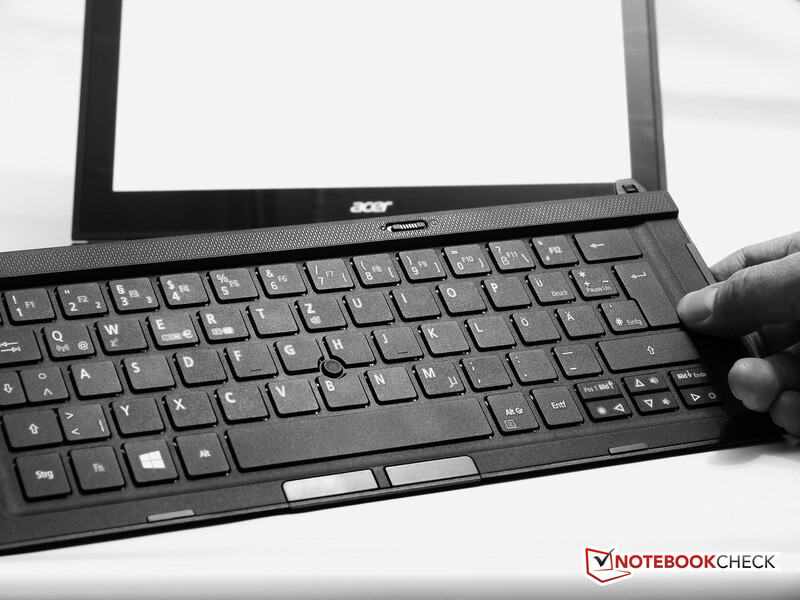 As the Acer Aspire Switch 12 includes a fast SSD you'll get a good responsiveness from the PC. Anyone coming from a laptop of 2-3 years ago with a hard drive is going to be surprised at how responsive the Switch 12 is. At the price of $699 though (RRP) there's a lot of performance and responsiveness here. 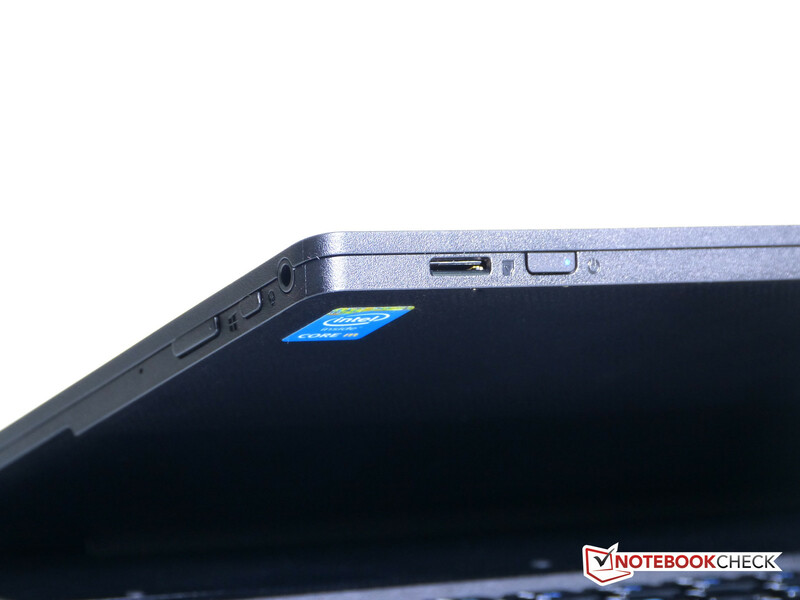 The Lenovo Yoga 3 11 is going to be the main competitor but the HP Envy 13 X2 must also be considered as it comes in at the same price, with a similar CPU and the same total weight when the case is included. 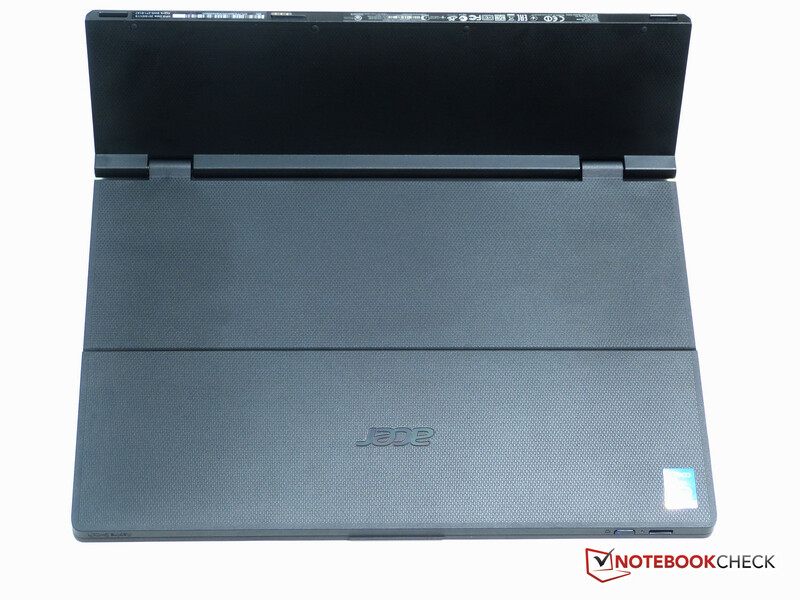 They key reason for the strict clock control is to enable fanless designs so in the Switch 12 we see 2013-era Ultrabook performance, in a fanless design. Cinebench scores are respectable and match other Core M-class PCs. 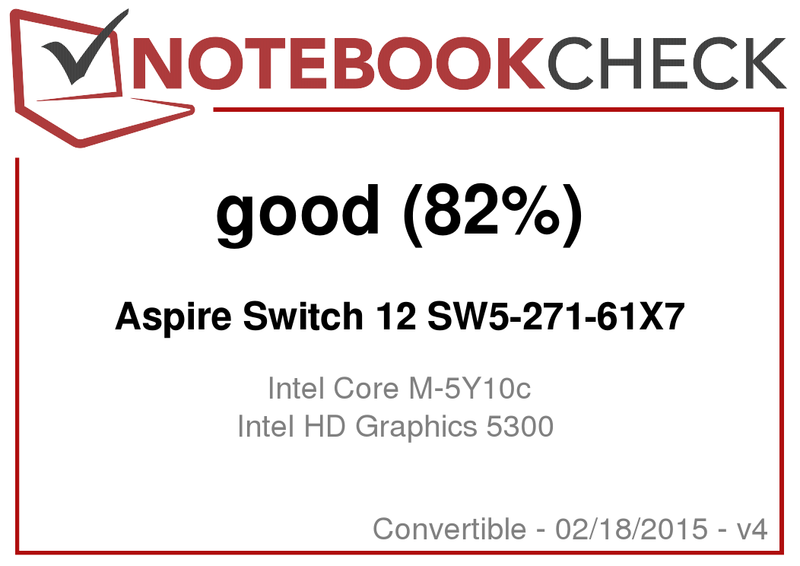 Pure CPU performance was well over double that of the Baytrail-M N2840 HP Stream 11 X360 but not quite as fast as the new Dell XPS 13 that has the Broadwell Core i5 inside. If you look at the Haswell-Y based Lenovo 11S scores you see a great improvement. 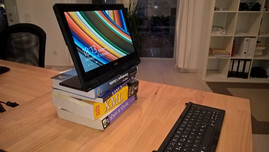 In the Google Octane browser test (see results above) the Acer Aspire Switch 12 returns excellent results with 3X the performance of a Baytrail-M platform. Given the AC-WiFi performance, fast disk and good web performance the Switch 12 is a great package for web-based work. The PCMark 7 score of 4117 is also a good indication that the Switch 12 is going to be snappy in general use. 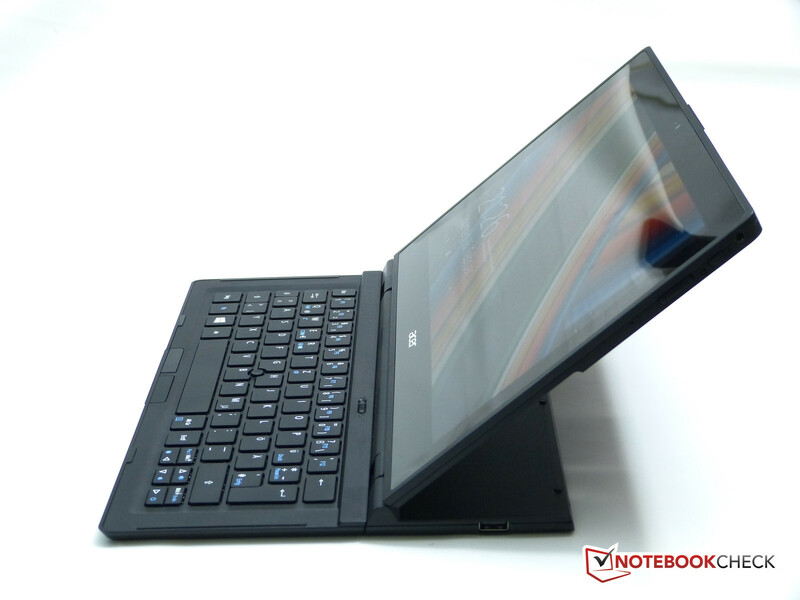 The Microsoft Surface Pro 3 and new Dell XPS 13 (2015) return better PCMark 7 scores however. As a 'desktop' PC for basic to medium-level Office work we don't see any issues. Disk storage speeds are good all-round with an impressive headline figure of over 500MB/s for the sequential read speed. 4K write speeds, one of the potential performance bottlenecks for a PC when in general use, are good. 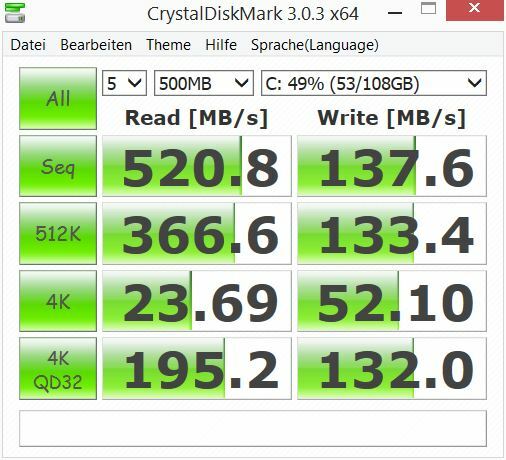 Crystal Diskmark scores are good. The HD5300 GPU included with the Core M platform is, in optimum conditions, comparable to the Haswell-era (2014) HD 4400 but there's one issue to be aware of. The load and heat generated by games is enough to cause Turbo Boost to throttle quickly causing performance levels to go down. In our gaming tests we used a warmed-up system before we did testing but in most cases, testing from cold brings very little boost in the figures. Watching WoW framerates as we ran around in circles gave us a feel for a 10-20% performance drop after time. In some games the pauses in the gameplay (while reading instructions, performing a menu action) might be enough to let the heat dissipate but in most games there'll be some sort of performance hit. In one test case using Grid 2 we saw the 'attract' demo drop to very poor performance levels over a 2 minute test. The good quality screen helps to improve the general feeling of gameplay and, as you'll read below, the built-in speakers are also enjoyable. Grid 2 really barked at us! Battery life under gaming is going be around 3 hours in most cases. We tested video processing under Quick Sync with Cyberlink PowerDirector 12 and didn't see that much of an advantage with either shows that the CPU is powerful enough to crunch through 1080p sequences or that the Quick Sync processing (hardware encoding) isn't that powerful. It's also possible that drivers and Core M support isn't built into the Power Director package. We tested Quick Sync again with an older version of Handbrake (svn6013) and it failed to convert using Intel QSV. The latest svn6825 worked and managed to convert Big Buck Bunny from 1080p to 720p at 274 fps. That's nearly 10 minutes of video in 54 seconds. Clearly there may be compatibility issues with the new QSV hardware and older software. 'PC gaming' options are slightly limited on the Switch 12 but we found some fun in a number of our tests. Un-benchmarked, but still tested, was Grid 2 which was enjoyable, sharp and gave a good audio experience through the front-facing speakers. WoW is playable on low settings with a reasonable resolution. The Anno 2070 demo gave us some trouble with audio (no audio after first run) and performance on medium and high levels with only 1366x768 resolution. The non-native resolutions didn't stretch to full-screen either, a problem we saw on WoW which was fixed by setting DX9 mode instead of DX11. Windows Store gaming is going to present no problem at all - GT Racing 2 was good fun in tablet mode using the accelerometer for steering control. 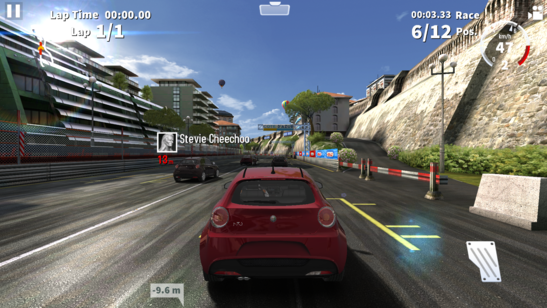 GT Racing 2 - a free Windows Store game. 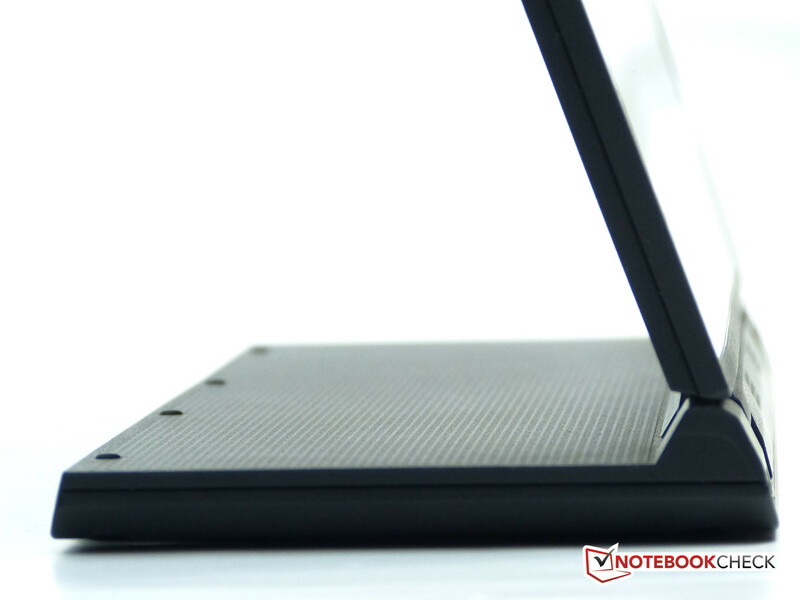 One of the key capabilities of the Core M platform is that it can drive ultrabook-level performance without a fan. The Acer Aspire Switch 12 is silent. There's a palm-sized patch behind the top of the screen where temperatures can rise significantly when gaming or doing heavy processing work. In laptop usage that's not a problem but in portrait orientation there's a chance that you might want to hold this area. There are always other ways to hold the tablet though (we used the stand a lot of the time) so this should not be an issue. 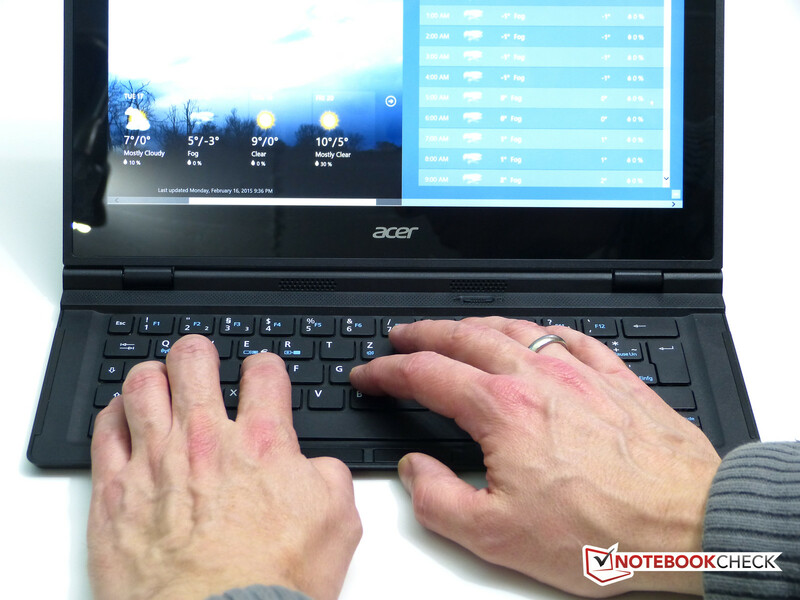 There's no heat generated at all in the keyboard - an advantage over traditional laptop designs. (-) The average temperature of the palmrest area of similar devices was 29 °C / 84.2 F (-6.4 °C / -11.5 F). Top marks to Acer for positioning and volume of the stereo speakers which are good enough to enhance the gaming experience. The frequency range is a little thin but enough for podcasts, streaming radio, YouTube and a little background music. While not quite the best sounding speakers available on a laptop-class device they're great for a tablet. Note that digital output is available via Miracast (compressed) over WiFi, HDMI (uncompressed) over cable, Bluetooth (highly compressed) and analogue output is available at the headset port. 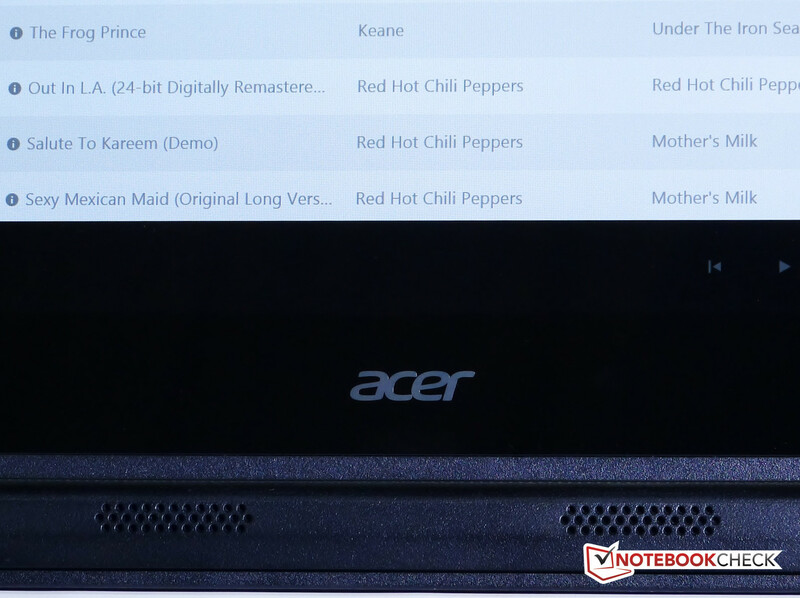 The Acer Aspire Switch doesn't support InstantGo / Connected Standby so you won't be able to stream music while the unit is off but there is a screen-off mode which will provide you with offline audio file playback for around 10 hours. In an idle test we saw just 2.8 watts of usage but the more important web browsing and video battery life figures are 6-hours and 6hr 18 minutes respectively. For a 12.5-inch screen this is a good figure although not quite enough for a full day of work without the power supply. 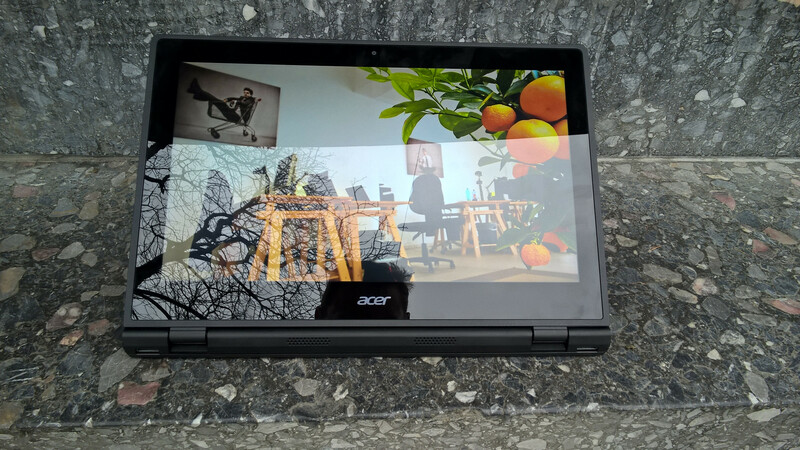 For 3D gaming you'll get about 3 hours out of the Acer Aspire Switch 10 which is also quite good as long as you're happy with the graphics experience. 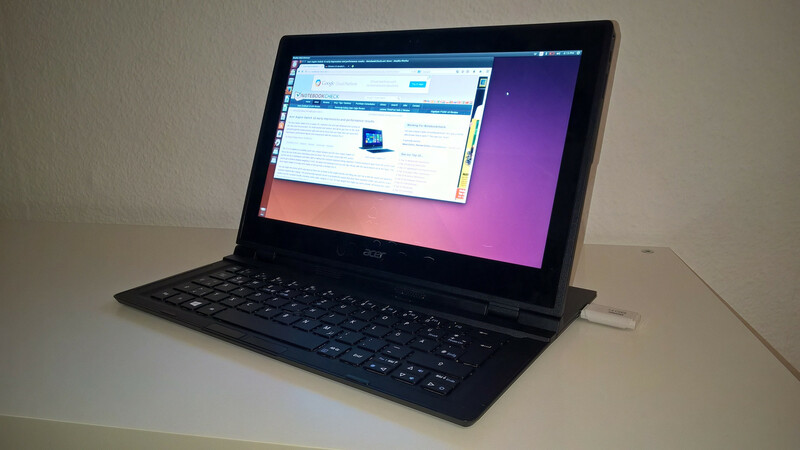 In a quick test of Ubuntu 14.10 desktop we disabled UEFI boot (and secure boot) and booted from a USB stick. Ubuntu booted quickly and to our surprise everything was working except the keyboard Fn features (volume, screen brightness etc.) Touch, mouse pointer, full HD, WiFi, Bluetooth, brightness were working. (We haven't tested the digitizer or battery life.) For developers, the security conscious and Linux fans in general this is a real value-add. 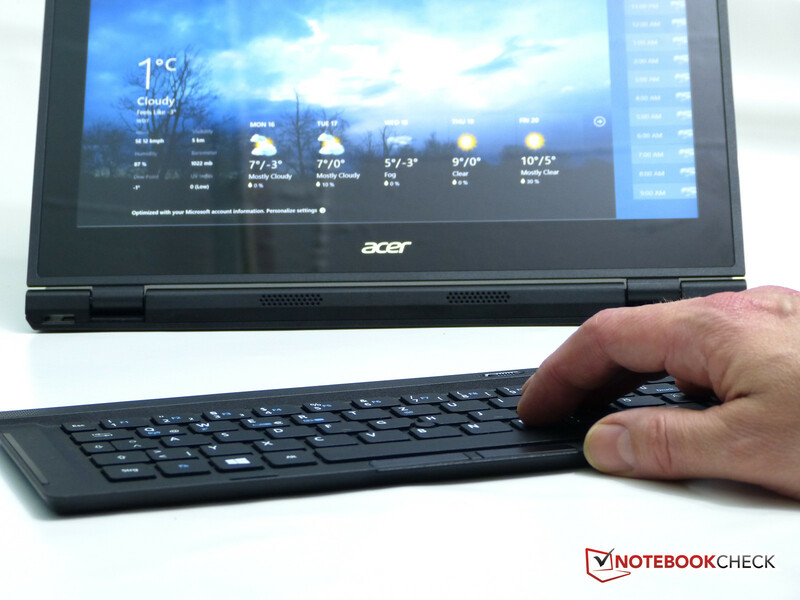 Reviewing the Acer Aspire Switch 12 hasn't been a quick job but it's been an enjoyable one. This multi-mode hardware can be used in a huge number of scenarios and it turns out that as a laptop it's one of the best on a lap! Not only are there many many ways to use the Switch 12 but there's a wide range of processing capabilities too. From reading the news at breakfast through Office work, editing and rendering 1080p videos for YouTube and even some desktop gaming. As a web-working tool it's perfectly pitched and 6 hours battery life in this scenario is going to be enough for most people. The screen is punchy, the speakers add to the entertainment experience. AC WiFi, fanless build and the fast 128GB SSD add up to great computing value. As consumer tablet the 1.1 KG / 2.4 pounds weight and large size means it's too heavy for quick and casual use but there's more to it than that. A digitizer layer and tent mode will be creative. productive and great for Miracast-based presentations and the stand offers options for holding the tablet in many different positions. The stand can also be used to 'hang' the tablet and the wireless keyboard works from 10 meters away giving presenters another option. The keyboard was a worry at first but as we continued our testing it was clear that it was accurate and easy to use although not in the same league as the best keyboards from HP, Dell and Lenovo. Some might even prefer this layout over the traditional touchpad though and as it can be removed for desktop working it's arguably a unit that has more ergonomic value than the classic fixed-keyboard laptop. Raw performance and connectivity are impressive for this fanless package and we enjoyed our gaming testing. Ubuntu booted and worked well from a USB stick. Our score of 82% should, perhaps, be higher but we marked it down for the Micro USB3.0 port where there's space for a normal port, the heavy total weight (a case is included, and required to protect the screen) and took a few percentage points off for performance which can degrade under hot and loaded conditions. Video encoding software that supports Intel Quick Sync might need an upgrade, the plastics are a little cheap, a keyboard backlight would have been great, there's only a single HD webcam and there's no upgrade possibility. For many of the target audiences these issues may be irrelevant but there are alternatives to be considered. The Lenovo Helix 2 just scored 84% in our test. The HP Envy 13 X2 scored 78%. 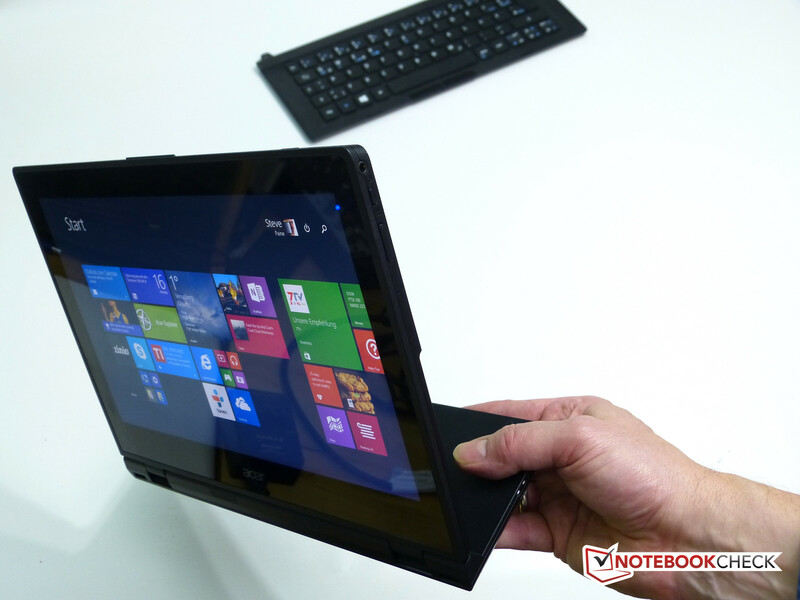 The Dell Venue 11 Pro 7140 scored 82%. 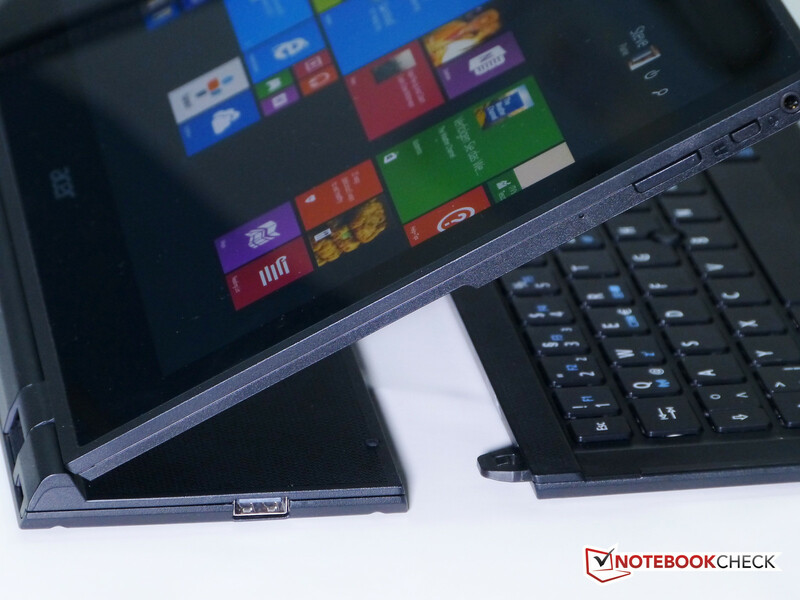 Competition in the Core M segment is hot and we still haven't reviewed the Lenovo Yoga 3 11 yet! 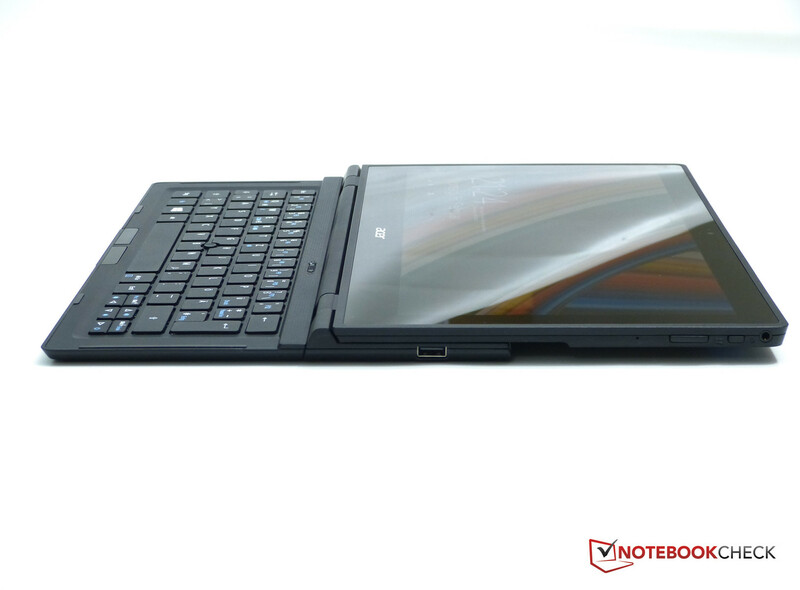 There's also the Surface Pro 3 to consider. Finally there's one product that might trump the Switch 12. 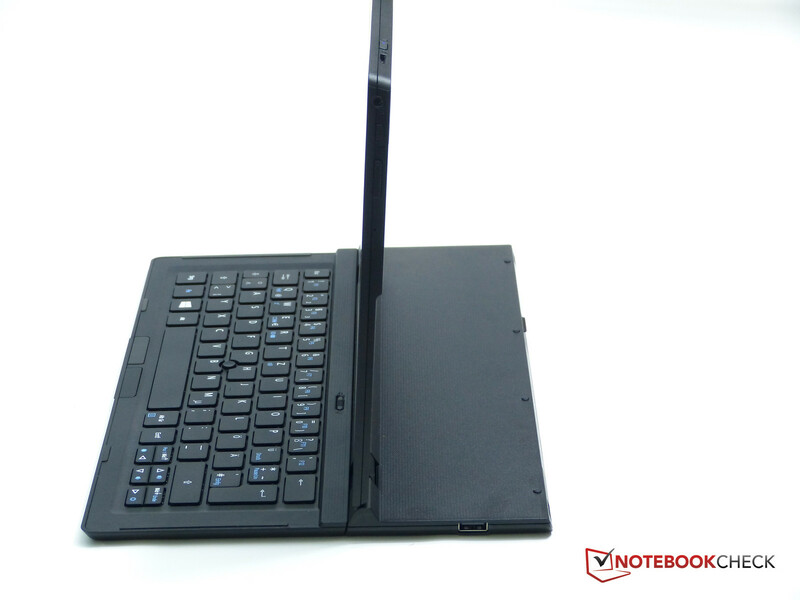 The ASUS Transformer Book T300 Chi is launching for $699 and has a much lighter tablet component. The keyboard is larger and heavier though so the total weight of 1.4KG is much the same. The T300 Chi won't have the flexibility of 'stand' modes though and that just might be the killer feature on the Acer Switch 12. 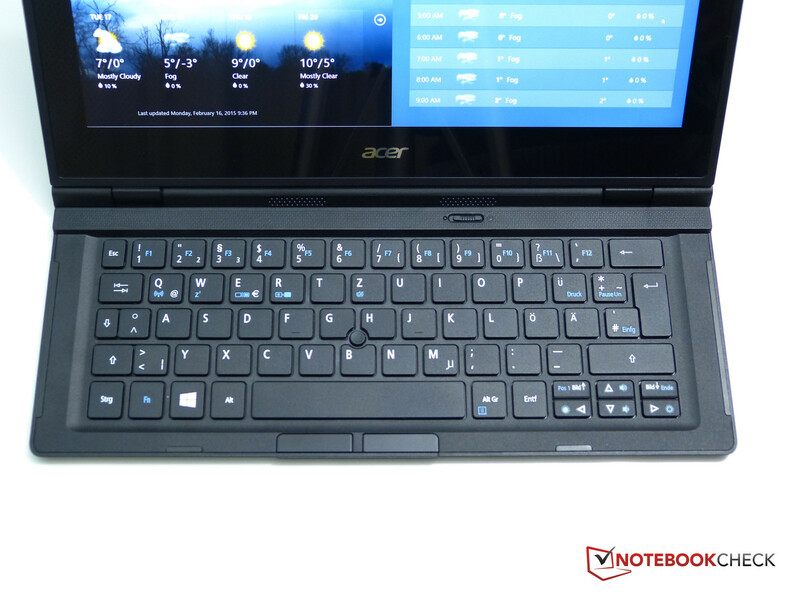 In Review: Acer Aspire Switch 10. 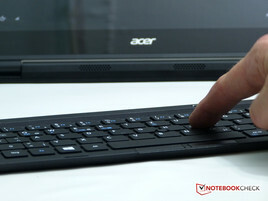 Test model courtesy of Acer. Lean-back goes to about 30 degrees. Unused space on the stand. Lots! This multi-mode laptop is inspirational. Keyboard backlight, enhanced port setup and improved casing materials. The removable keyboard allows new usage scenarios. 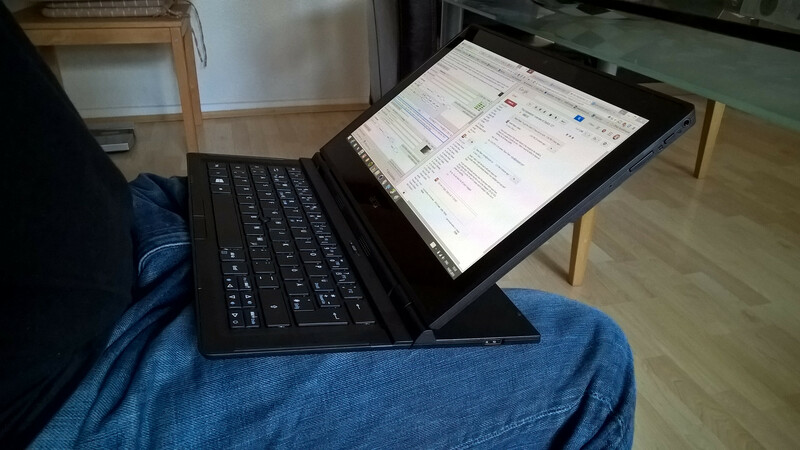 It works as a 'lap' top when docked too. The Haswell, Core-based Surface Pro 3 and the Core M based Lenovo Helix 2, HP Envy 13 X2, Dell Venue 11 Pro 7140. 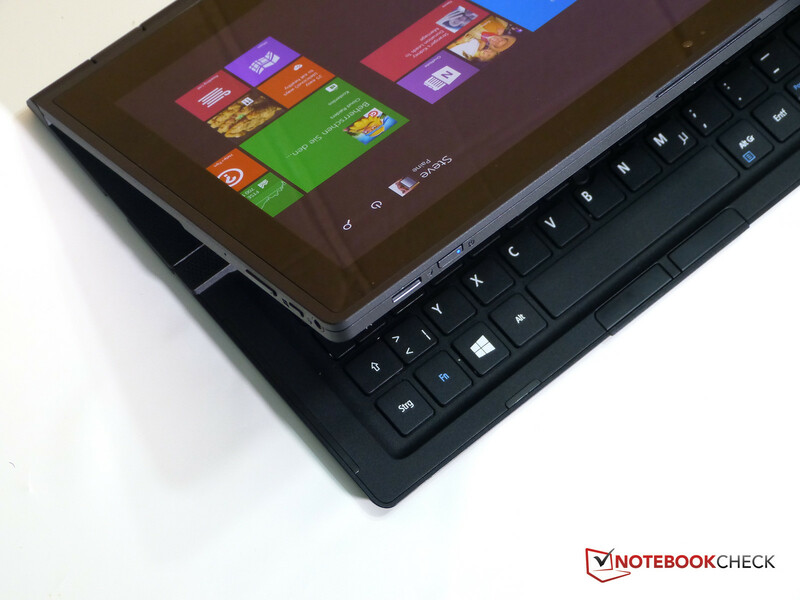 The ASUS Transformer Book T300 Chi and Lenovo Yoga 3 11 are yet to be reviewed by us but keep a look out for these too.